Melbourne in spring. The weather swings from windy and cool to warm but not-quite sweat-generating. There’s the dynamism of the city centre that contrasts with the peace and quiet of the walking paths along the Yarra. This is a fine city for visitors, as those attending the 2018 New Economy Network Australia conference discovered. 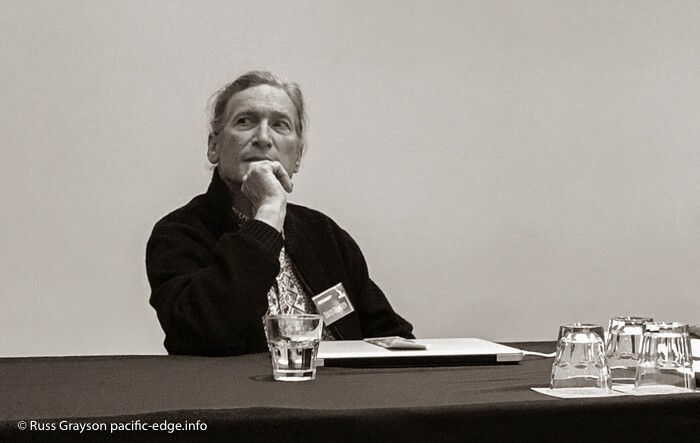 Eric Holt-Giminez and food systems researcher, Eva Perroni. HERES’s a big thanks to the team that organised the 2018 New conomy Network Australia (NENA) conference in Melbourne. Here’s another to the catering crew whose tasty and plentiful food reinvigorated brains and bodies quietened by too much sitting. And here’s to the young woman who crewed the coffee machine and kept us well caffeinated during breaks. The conference was held at the William Angliss Institute in LaTrobe Street in the Melbourne CBD. How did it compare with NENA’s two previous conferences, the first in Sydney and the second in Brisbane? It was different in that it had fewer ‘talk at’ type addresses and more ‘talk with’ workshop sessions. The conference blended both formats and included an open-space segment in which participants led their own small group sessions. 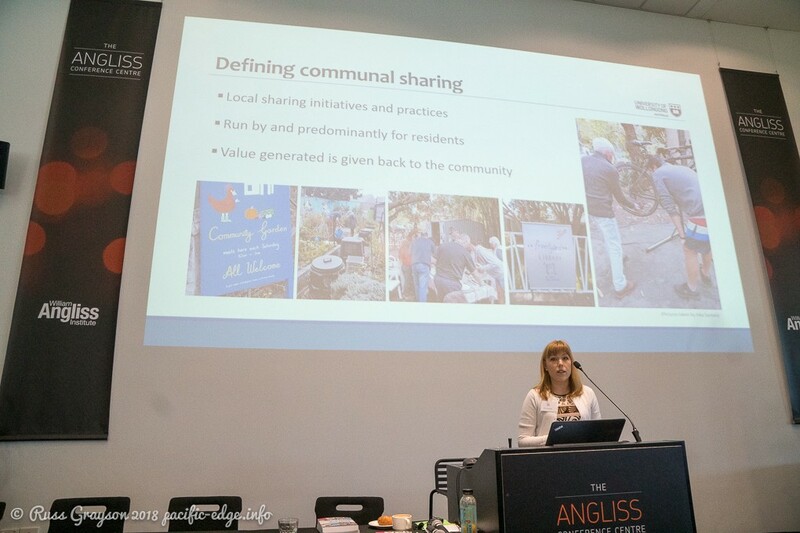 The 2018 conference brought a welcome focus on the ‘commons’, the idea of publicly-owned and controlled infrastructure. The commons is one of those issues-in-waiting, a potential political campaigning focus for some lobby that can read the writing of things to come, a focus now being sharpened as neoliberal governments privatise public assets and turn our common-wealth into markets and private-wealth whose economic benefit flows to the few. There was also a strong focus on food systems at this conference, far more so than at the two previous national confrences, as well as on alternative working-life structures such as co-operatives, platform co-ops and more. Food security (year-round access to a sufficient quantity of nutritious food) and food sovereignty (access to the foods of choice and viable livelihoods in farming and the food industry, based on provision of nutritious foods, regenerative farming and distributional fairness — that’s an impromptu and poor definition, let’s hear yours’ in the comments) were terms heard during the conference. They were new to some, familiar to many there. Food arose as an economic and political issue around 14 or so years ago with the emergence of organisations like Sydney Food Fairness Alliance (now subsumed into the Right to Food Alliance) and, later, the Australian Food Sovereignty Alliance (AFSA) and Sustain, the Melbourne-based food advocacy and educational agency started by Nick Rose, educator at the Willian Angliss Institute where the NENA conference took place and an organising team member for the conference. 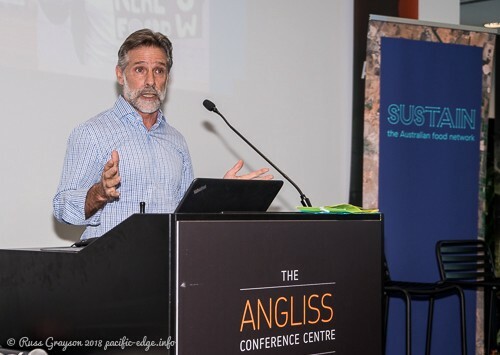 Several people attending the conference had previous involvement with AFSA, including Nick Rose and myself who, with Brisbane Food Connect’s Robert Pekin, started the organisation in the final months of 2010. The Alliance went on to develop the Peoples’ Food Plan as the documentary basis for the organisation’s advocacy and educational work. Nick Rose from the William Angliss Institute in Melbourne. Any discussion of a conference is biased to the sessions we each attend and can only be a partial appreciation of the entire event. The NENA strategic planning day attracted around 40 participants the day prior to the conference. This occupied the first day in the Church of All Nations in inner-urban Carlton. It was designed to give a sense of direction and focus to the organisation. After two years during which NENA has been working out what sort of entity it is, session attendees worked in small focus groups to record ideas for what it might do and sort them on the wall. They should appear in the event notes. 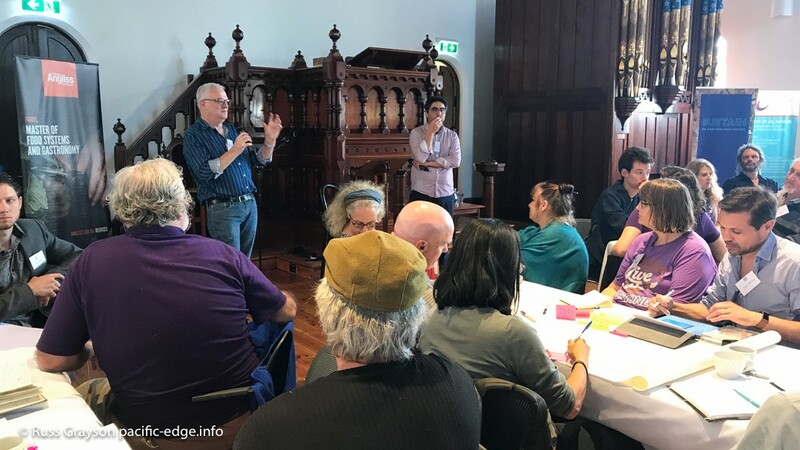 The strategy day was the culmination of the work done by its Steering Team — Michelle Maloney, Bronwen Morgan, Darren Sharp, Jose Ramos, David Thompson, Alan Greig, and more recently, Sabrina Chakori — in keeping the NENA dream alive. Michelle Maloney launches the NENA strategic planning day. 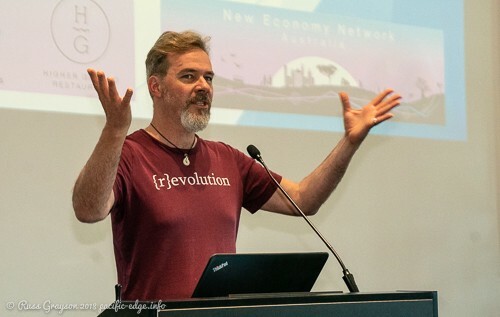 A tall, clean-cut man savvy about the commons, the sharing economy and new models of co-operative business emerging from the digital economy, Darren Sharp is associated with Sharable, an organisation educating about and advocating for the commons. Darren’s consultancy, Social Surplus, is based in Melbourne. solutions that operate at the urban scale. The first breath of the new economy is taken in the body of the old. The ideas Darren spoke of are those of a post-capitalism economy whose seeds, whose components, are being prototyped and applied in the present economy. Distributed leadership offers an alternative to the tired old hierarchical leadership of so many organisations in society, whether government, corporate or community-based. finding the best ways of working. Sharing power was discussed as was the ‘tyranny of structurelessness’ with its hidden hierarchies. Those with power can recognise that they have it and distribute it. Power should be questioned. A goal of leadership should be to make itself obsolete through distributing its role rather than setting up middle management. Viewed as an ecosystem of interacting parts, social ecosystem leadership would support the network structure of organisations to encourage collaboration. Amanda Cahill was one of the people who started NENA. 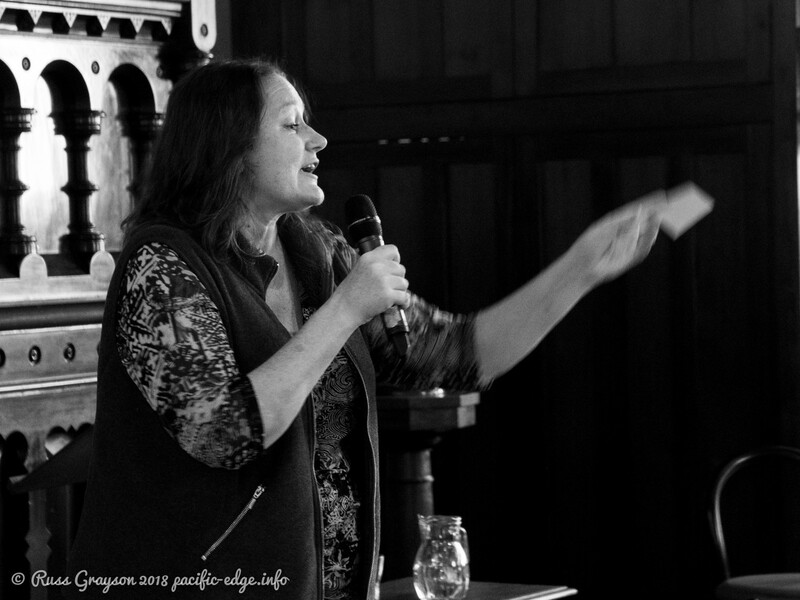 Her talk reminded us that there are people out there doing good stuff and what would benefit them would be connection. NENA’s role could be to get to a place from which we can respond confidently with alternatives and ideas, and develop a tool kit to do that. Joel Orchard is a tall man, his dark beard contrasting with his hair and his speech and clothing suggesting a blend of the rural and the urban. What sets Joel apart from many of his contemporaries is that he is a small-scale organic farmer on NSW’s subtropical North Coast. That’s a profession appealing to a reasonable number of younger people who want a life different to what society usually offers them but who are thwarted by economic barriers. Joel’s session continued the food strand that permeated the conference. He spoke of how a viable small-scale, regenerative farming industry now exists and of the challenges faced by young farmers coming into the industry. Land ownership is one of those challenges. Most of the farmers Joel knows through the young farmers’ alliance he set up cannot afford the inflated price of farmland on Australia’s east coast. Joel is no slouch when it comes to developing a better model of farming. He was one of the people who set up the CSA Network Australia & New Zealand (CSA: Community Supported Agriculture). The Network engages in education and development of the farmer-direct-to-eater produce distribution system that is growing across the country. With its direct connection, no middleman is needed. CSA’s were reportedly invented in Japan and spread to the US and the UK. Their arrival in Australia probably dates from the 1990s yet it is only in recent years that they seem to have grown more substantially. Sydney, to my knowledge, has had perhaps two or three attempts at the CSA model of food distribution. One was reported to have dropped the CSA model and resorted to organic production for the local market because distribution was too difficult due to the farm’s distance from the city. Another, the market garden was located the NSW Central Coast north of the city, operated successfully for a time through an Inner West distribution point, then the farmer packed up and left the state. Those are risks with the single-farmer CSA model. In Sydney, they have been superseded by the multi-farm distribution model of intermediary organisations linking farmers and urban subscribers, like Sydney Food Connect, now closed, and its successor, Ooooby (Out Of Our Own backyards). 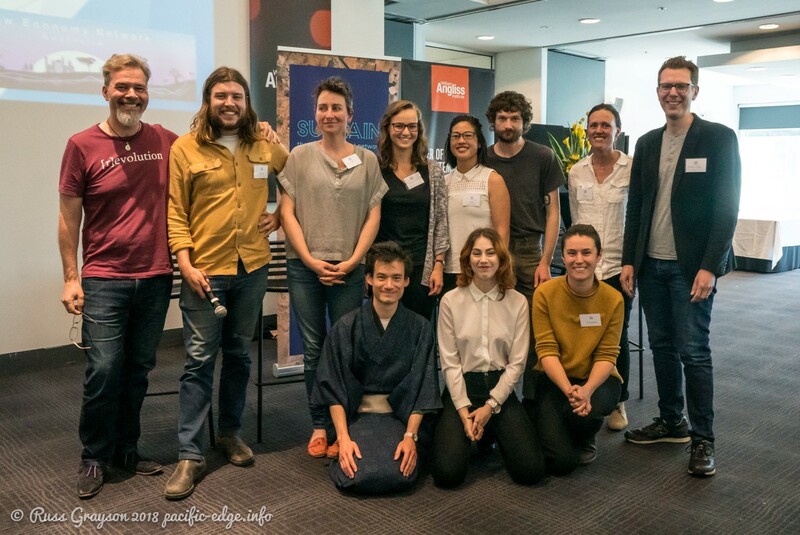 Joel spoke at Sydney’s Food Policy Council workshop in Redfern and at the Food Utopias event at University of Sydney during the previous week. 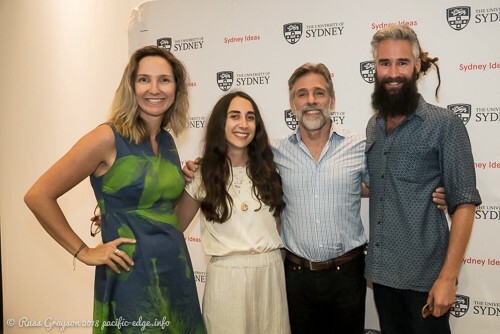 Joel Orchard (at right), with Eric Holt-Giminez, Eva Perroni and Alana Mann at the Food Utopias event at Sydney University law school in the week before the NENA conference. 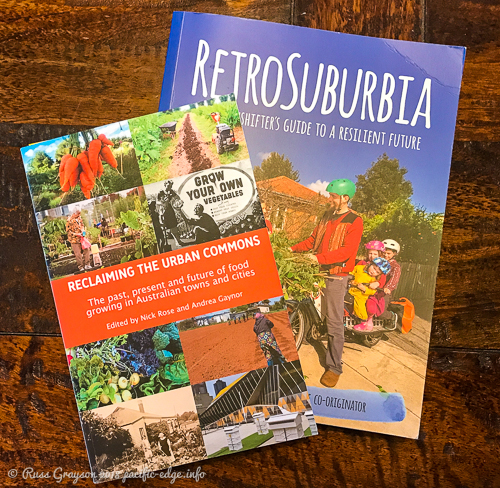 Drawing on his book, Retrosuburbia launched in April this year, permaculture design system co-founder, David Holmgren, spoke of reviving the household economy and about community-based non-monetary economies as the social bases for exchange. David lives with partner Sue Dennett near Hepburn in central Victoria where he has been modelling the household economy as an economic model. He says food production is the “wellspring” of new economic structures. With their underutilised landscapes, Australia’s suburbs have potential to increase the production of food in urban backyards and community gardens. This is already happening. 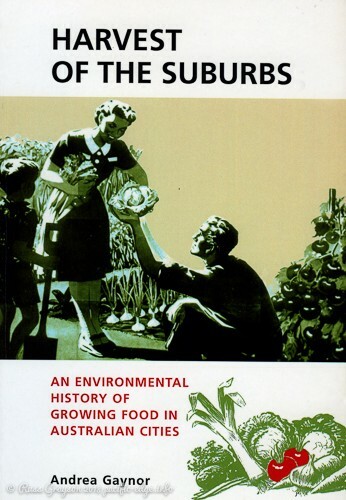 Urban food production has been a feature of the suburbs well back into the Twentieth Century. It was more-recently stimulated, first by the rise of the organic gardening movement of the 1970s and beyond and, more recently, by the permaculture design system. Documentary records of backyard garden-farming are scarce. Some exist around the growing and selling of backyard produce from the depression years of the early 1930s, and others of the Gardening For Victory campaign designed to improve food self-reliance in Australia during World War Two. The 1991 census was the first, and only, to ask about household food production. Then came the 2006 book, Harvest of the Suburbs: an environmental history of growing food in Australian cities by Andrea Gaynor. David proposes a new suburban economy based on food. It is one of those good ideas that would face serious challenges because of the competition for access to public open space in our big cities. Were any social movement, one greater than what we already have, to pursue David’s idea it would do well to ally with those working to reduce the loss of urban fringe market gardens and orchards to low-density urban sprawl. The Sydney Food Fairness Alliance did good work towards this goal in the first decade of the present century, however it does not appear to be a major priority among today’s food advocacy organisations. David spoke of the “hedonistic treadmill” of consumerism and its replacement with “frugal hedonism”, a topic explored in the book, The Art of Frugal Hedonism by Australian authors, Annie Raser-Rowland and Adam Grubb. Unapproved action at the bottom leads to later acceptance of ideas, David said in proposing grassroots action through informal organisations to develop new structures that would work in a post-neoliberal polity. With Facebook’s Cambridge Analytica personal data harvesting scandal, with Google’s personal tracking of our movements and lives and with data harvesting an increasing focus of digital reformers, the security of our personal information in the hands of platform capitalism has never been under such scrutiny. Platform capitalism and social media are new in the corporate world. Along with the scandals, the intrusions, Russia’s digital intervention in US elections, Chinese government theft of Western intellectual property through its hacking of government and corporate digital systems, and the hacking of personal information we encounter all-too-frequently, misuse of online systems have led to a distrust of corporate and government competency in personal information management and security. Some of the problems can be put down to tweaking systems new to economic life. Some can be put down to government and corporate digital incompetence and theft. Amid this background it was good to attend the session on digital sovereignty by the crew from Free Software Melbourne. “Free, as in freedom… free software for human rights and community empowerment”, explained a speaker. 1. To be able to run software without restrictions like digital rights management. 2. To be able to study and change software, including source code. 3. To be able to share exact copies of software. 4. To be able to share modifications to software. Although there are challenges in switching to free software, free and open source software is the path to technological liberation and to developing real-world solutions, including those the focus of NENA. It is not about techno-optimism, speaker Koji Payne said. The Linux operating system, Mediawiki, Wikipedia, Apache server software,the TOR browser and Signal messaging software are popular open-source software solutions in common use. The session was a fresh approach to digital culture that put people before platforms. Fresh from his speaking engagement at Sydney’s Food Policy Council workshop and the Food Utopias event at UNSW law facility the previous week (read report of Southern Cross University event here), Eric Holt-Giminez brought his experience as director of the US food organisation, Food First, to deliver a big picture scenario around food security and the need to reform food systems. Eric Holt-Giminez from the US organisation, Food First. Eric, an agroecologist and political economist, is author of a new book, A Foodies Guide to Capitalism. He sees the fair food movement as composed of reformers, who want to build cooperation with social progressives, and radicals who want to change the rules to enable alternatives to prevail. What is needed is an alliance between reformers and radicals to overcome divisions, he said. Food should be part of the social commons so that all have access to it, yet the fair food movement is too fragmented and, thus, at present has insufficient strength to be a major influence on food system economics and politics, Eric said. 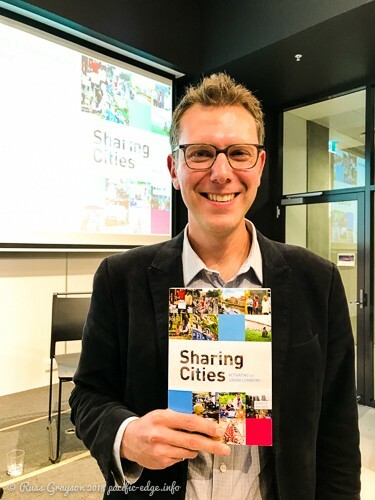 Conferences are good places for book launches, and the NENA conference was just that, with the launch of Reclaiming the Urban Commons. Edited by Sustain’s Nick Rose and Andrea Gaynor, whose earlier book, Harvest of the Suburbs, investigated the food productivity of Australia’s suburbs, the new book is a compendium of case studies of food growing in Australia’s towns and cities. 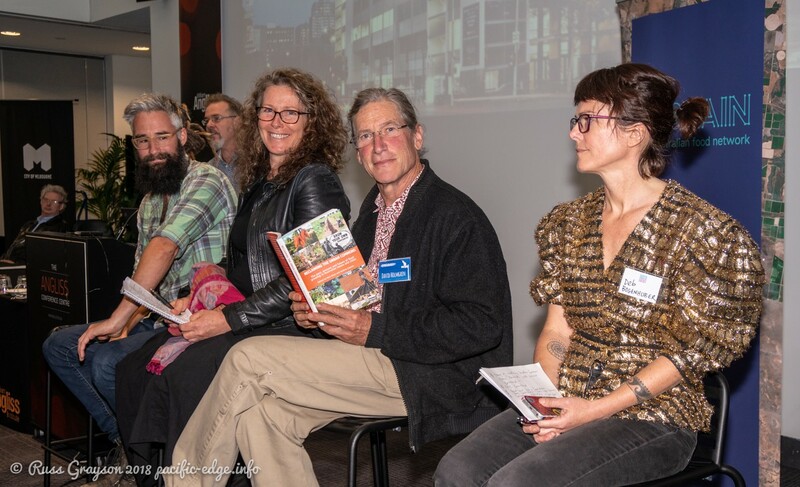 Some of the poeple wro wrote chapters in Reclaiming the Urban Commons, From left: Joel Orchard, Morag gamble, David Holmgren, Deb Bogenhuber. There was so much more to this year’s NENA conference, an event packed solid with ideas and examples of initiatives already on the ground. Perhaps the conference could have been promoted as a festival of alternative economic ideas, some existing, others soon to exist. 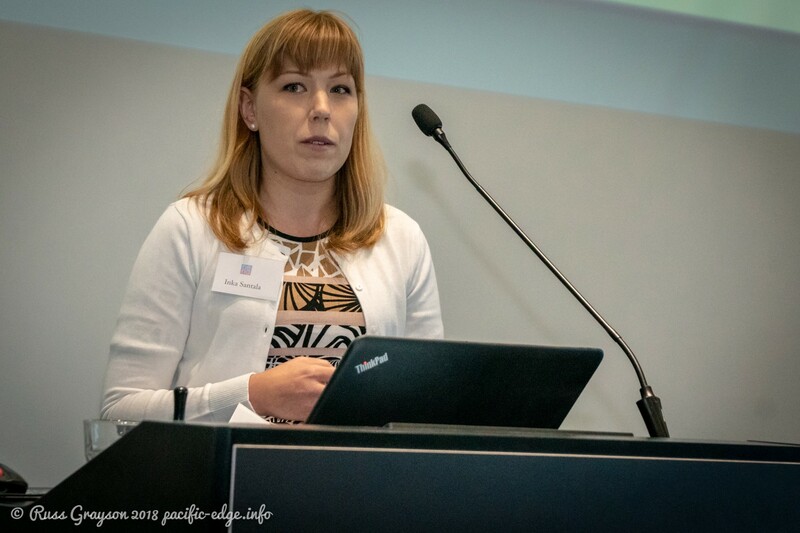 Inca Santala, from Finland and now resident in Australia, reported on her research into community-based food systems. Because of the number of speakers and workshops around food systems, the conference might also have been promoted, in-part, as one about a better food system. Past fair food conferences have featured mostly small-scale farmers, urban food producers and a few lobbyists. The NENA conference extended this to include those pioneering new food initiatives and economic strucures, and brought fair food issues and solutions before a wider, economically-savvy audience, some of whom have a track record of involvement in fair food education and advocacy and others who have set up systems. 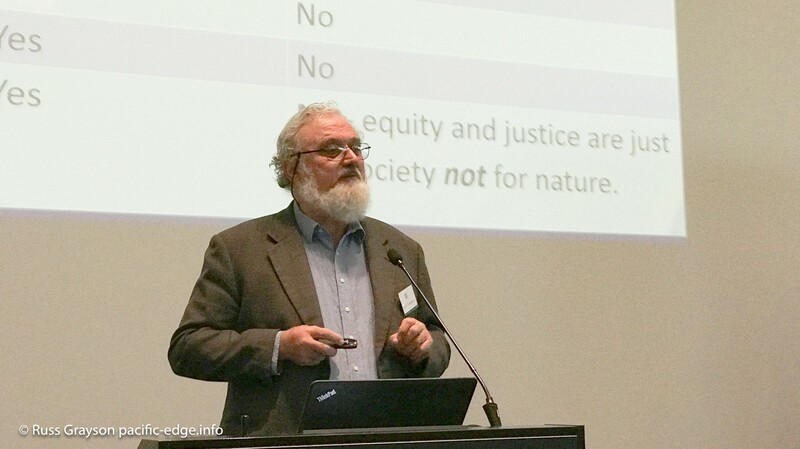 Just as combining two plants produces a more-productive hybrid, so could combining the farming and food system expertise and the new economic ideas evident at the NENA conference produce a more effective and comprehensive fair food movement. Haydn Washington discussing social and economic issues. Haydn is author of a number of books. Does the NENA conference signify anything significant in our search for better economic models? It signifies a growing interest in them as the social, economic and environmental shortcomings of the neoliberal model become increasingly obvious. The conference also highlighted the value of actually creating new models rather than theorising and talking about them. This is not to downplay analysis, more to amplify action by economic makers and hackers. It takes time to digest what we hear at conferences and I think the avalanche of good ideas and positive examples that swept over us at the 2018 NENA conference will be mulled over for some time to come. Most of the organising crew of the NENA 2018 conference in Melbourne. 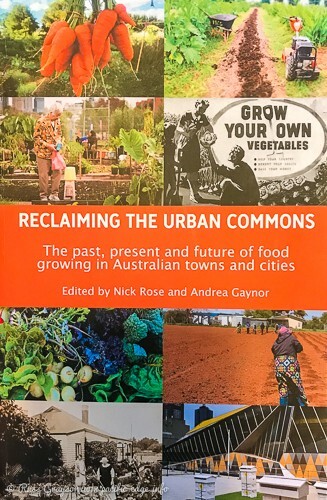 Reclaiming the Urban Commons; 2018, Nick Rose, Andrea Gaynor ed; UWAP Publishing, Western Australia. 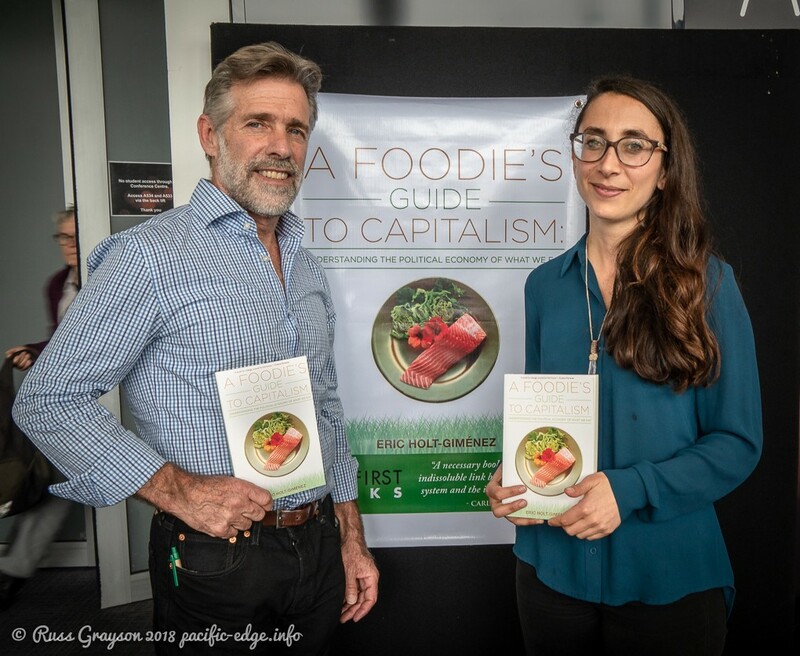 A Foodies Guide to Capitalism; 2017, Eric Holt-Giminez; Monthly review Press, Food First Books, USA. ISBN 978–1 58367–659–2. The Art of Frugal Hedonism; 2016, Annie Raser-Rowland A, Adam Grubb; Melliodora, Hepburn Victoria. ISBN 9780994392817. The Little Green I’m Afraid of Economics but I Want to Save the World Book; 2018, Geoffrey Davies; BetterNature Books, Braidwood NSW. ISBN 978–0–6482968–3–6. Harvest of the Suburbs: an environmental history of growing food in Australian cities; 2006, Andrea Gaynor; University of Western Australia Press, Perth. ISBN 1 920694 48 X.